The Leonia Academy of Science was founded at Leonia High School in September 2003 for a select number of the district’s best students interested in STEM Curriculums including Science, Technology, Engineering and Mathematics. Leonia High School and Kulite Semiconductor Products, Inc. enjoy a partnership generating long term support for this rigorous science program. Kulite, being a state of the art semiconductor manufacturing company located in Leonia, NJ has always supported Leonia High School. Support includes lab coats delivered to the new freshman students who enter the Academy each year. Kulite is proud to have the opportunity to help these very special students succeed in every way possible. 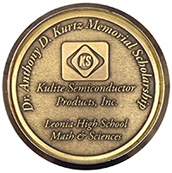 Kulite Semiconductor Products, Inc. ("Kulite") of Leonia awards its Dr. Anthony D. Kurtz Memorial Scholarships to five Leonia High School graduating students who excelled in math and science studies. The awards are dedicated to the memory of Dr. Anthony Kurtz who founded Kulite in 1959. For 50 years he was the Chief Scientist and CEO of the company and the driving force in helping to establish Kulite as a world leader in pressure transducer technology. As a believer in higher education, Dr. Kurtz encouraged his employees to enroll in company subsidized college courses and initiated a scholarship program for employee’s children. To continue this support and education and to honor the memory of her husband, Nora I. Kurtz, Chairwoman of the Board and CEO of the company, established the annual program in 2011. In May of each year NJ/NY Community Blood Services, a not-for-profit organization that supplies blood and blood products to more than 30 hospitals in the NJ/NY region, spends the day at Kulite’s campus holding our annual blood drive. This annual event is held to help alleviate critical blood shortages in our immediate area. Over 50 Kulite employee’s participated in the last blood drive. During the month of December each year, Kulite holds its annual holiday toy drive with great success. A large number of toys and children’s gifts are donated by our very generous employees including dolls, puzzles, games, books, toy cars and many other gifts! Thanks to all of our generous contributions many children in need will receive gifts each holiday season. Kulite’s employees continue to come through for those in need! We show our compassion and generosity for those less fortunate. Every other year the Kulite employee community comes together in November to collect new and used coats for those in need. With the generosity of the Kulite employees, a donation is made to The Salvation Army in an effort to help those in need of warm clothing for the cold winter months. In an effort to show support for our troops stationed around the world, the Kulite family of employees collects wrapped, unopened candy shortly after Halloween each year to be sent to Operation Gratitude. Operation Gratitude prepares and sends packages to our troops. In the last drive we sent 140 pounds of candy for distribution to our Armed Forces.